The Grammy Awards have been held in many prestigious locations. In 1971 the Grammy Awards had its first live telecast and therefore had its own sole venue each year for the telecast. From 1963 to 1970 the Academy aired a TV special annually called "The Best On Record" which highlighted the awards dinners. Since 2000, the Grammy Awards have been held in the Staples Center located in Downtown Los Angeles. Grammy Award ceremonies have been televised since 1971. The Staples Center has hosted the most Grammy telecasts, having hosted seventeen times. The Shrine Auditorium which hosted sixteen times was surpassed by the Staples Center in 2017. Los Angeles has held a total of 37 Grammy Award telecasts, with New York having hosted nine times and Nashville serving as host once. Listed below is a table showing Grammy Award ceremonies. Future editions of the Grammy Awards are designated in italics. With eighteen telecasts hosted, the Staples Center have hosted the most Grammy telecasts. The Staples Center surpassed the Shrine Auditorium as the most frequent host in 2016. The Shrine Auditorium hosted fifteen times between 1978 and 1999. 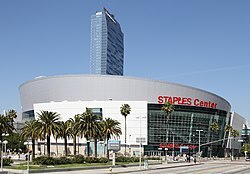 While the Staples Center hosts the main telecast which is broadcast on CBS, the premiere ceremony (also known as the Pre-Telecast) is held at the neighboring Microsoft Theater. The MusiCares Person of the Year tribute is held at the neighboring Los Angeles Convention Center two days prior to the Grammy Awards. Los Angeles has held a total of 37 Grammy telecasts, and a total of 44 including the pre-broadcast era years. The last time the Grammy Awards took place outside of Los Angeles was in 2018. ^ "The Complete List of Grammy Nominations". The New York Times. The New York Times Company. December 8, 2005. p. 1. Retrieved April 29, 2010. ^ "49th Annual Grammy Awards Winners List". National Academy of Recording Arts and Sciences. Archived from the original on December 20, 2006. Retrieved July 12, 2010. ^ "2009 Grammy Award Winners". Grammy.com. Retrieved 1 May 2011. ^ "53rd GRAMMY Awards Slated For Feb. 13, 2011". Grammy.com. Retrieved January 14, 2018. ^ Mervis, Scott (December 1, 2011). "Grammys stumble with Kanye West album snub". Pittsburgh Post-Gazette. Retrieved December 15, 2012. ^ "2013 Grammy Nominations". MTV. December 6, 2012. Retrieved December 6, 2012. ^ "The Academy Introduces The GRAMMY Awards Premiere Ceremony". Grammy.com. November 8, 2014. Retrieved January 14, 2018. ^ "GRAMMY AWARDS® TO RETURN TO STAPLES CENTER IN LOS ANGELES IN 2019". Grammy.com. June 28, 2017. Retrieved January 14, 2018. This page was last edited on 10 February 2019, at 19:39 (UTC).